Fields | Coral Springs United F.C. Take the Sawgrass Expressway (869) to Coral Ridge Drive (Exit 10). Turn right on Coral Ridge Drive (South) to Westview Drive. At Westview Drive turn left (East). North Community Park is located one block east on Westview on your left. Take the Sawgrass Expressway (869) to University Drive (exit 12). Turn left on University Drive (South) to Westview Drive. At Westview Drive turn right (West). North Community Park is located one block west on Westview on your right. Take the Sample Road Exit. Go West on Sample Road to Coral Springs Drive. South on Coral Springs Drive to Lakeview Drive. The entrance to Cypress Park is on the left. Fileds are in the back of the park across the bridge. Take the Atlantic Blvd Exit. Go West on Atlantic Blvd. to Coral Springs Drive. Go North on Coral Springs Drive to Lakeview Drive. The entrance to Cypress Park is on the right. Fileds are in the back of the park across the bridge. Take the Atlantic Blvd Exit. Go East on Atlantic Blvd. to Coral Springs Drive. Go North on Coral Springs Drive to Lakeview Drive. The entrance to Cypress Park is on the right. Fileds are in the back of the park across the bridge. Take SR-869 North (Sawgrass Expressway) towards Coral Springs. Exit going East on Sample Road. Turn right on Sportsplex Drive. 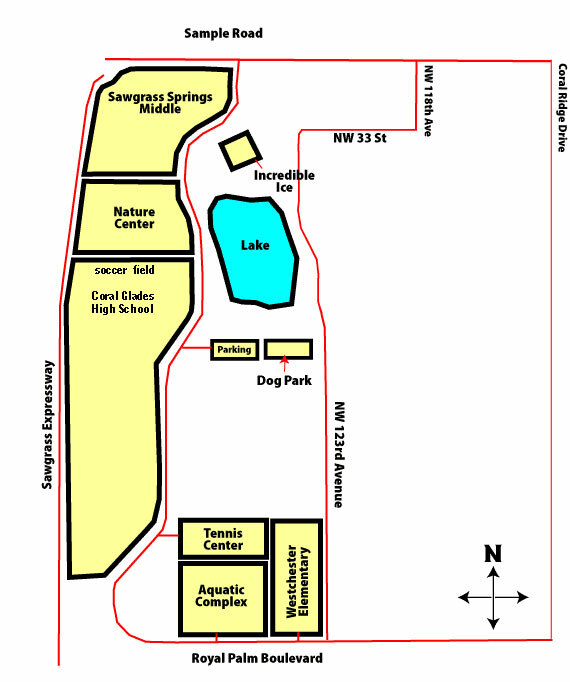 The entrance to Sportsplex Park is on your right and is located on the grounds of Coral Glades High School. Take SR-869 South (Sawgrass Expressway) towards Coral Springs. Exit going East on Sample Road. Turn right on Sportsplex Drive. The entrance to Sportsplex Park is on your right and is located on the grounds of Coral Glades High School. Take I-95 North towards Coral Springs. Exit going West on Sample Road. Travel approximately 10 miles west past Coral Ridge Drive where you will then turn left on Sportplex Drive. The entrance to Sportsplex Park is on your right and is located on the grounds of Coral Glades High School. Take I-95 South towards Coral Springs. Exit going West on Sample Road. Travel approximately 10 miles west past Coral Ridge Drive where you will then turn left on Sportplex Drive. 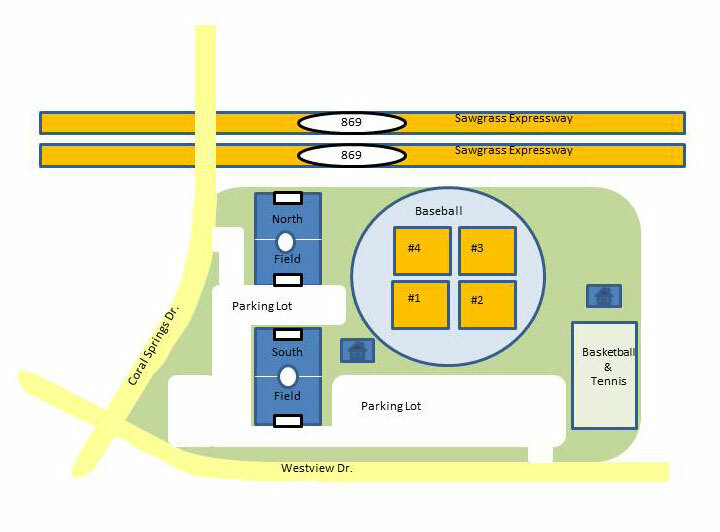 The entrance to Sportsplex Park is on your right and is located on the grounds of Coral Glades High School. Take the Sample Road Exit. Go West on Sample Road to Coral Springs Drive. South (left) on Coral Springs Drive to NW 29th Street. Go East (left) on NW 29th Street. The entrance to Mullins Park is on the right. Take the Atlantic Blvd Exit. Go West on Atlantic Blvd. to Coral Springs Drive. Go North (right) on Coral Springs Drive to NW 29th Street. Go East (right) on NW 29th Street. The entrance to Mullins Park is on the right. Take the Atlantic Blvd. Exit. Go East on Atlantic Blvd. to Coral Springs Drive. Go North on Coral Springs Drive to NW 29th Street. Go East (right) on NW 29th Street. The entrance to Mullins Park is on the right.